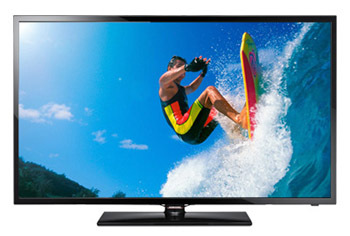 The UN32F5000 is the smallest 32 inch TV equipped with a 1080p display. The F5500 and the F6300 series also have this size, but those included smart TV features and a higher refresh rate on the 6300. The 32F5000 is a budget oriented model aimed at TV shoppers looking to fill a smaller room with a TV that has pretty good picture quality. The 1080p feature on a TV this size is questionable to some since it can be hard to really spot the difference in some content. A full HD display is really useful when games or a computer is used with the display. There isn't much else in terms of features to make this one stand out. It has a similar design to the EH5000 series from last year except an inch and a half shaved off from the depth of the TV. Note: The Samsung UN32F5000 can also be found as the UN32F5050 is some stores. The only difference between the two model numbers is the color of the logo. The F5000 has a clear logo while the F5050 has a rose black logo. Everything else specification wise is the same. This is just a way to differentiate the model for different retailers. The picture quality on the UN32F5000 is good for not having some of the top tier features used to make it even better. This is because of the powerful led back lighting. The back light produces a bright and clear picture that shows bright whites and good contrast. Color is a strong point, but it can also tend to over saturate to the point of being unrealistic. It is easy to enter the picture options menu and turn down the back light setting a bit to keep this problem in check. The F5000 has a Clear Motion Rate of 120 that is supposed to improve sharpness, clarity and contrast when enabled. There wasn't much of a change, so that feature shouldn't be one of the reasons for picking this TV up. There is also the Wide Color Enhancer Plus. This feature is supposed to enhance the range of colors seen in certain types of content. Judging by the bright colors, this may be beneficial to the picture quality when colors aren't over saturated. Side angle viewing on the UN32F5000 is on par for a TV in the value category. Contrast and color begin to degrade at about 30 degrees either from left to right or up to down. This is typical for LCD/LED TVs and this one is not plagued by terrible viewing angles. Of course the best viewing position is front and center, but that cannot always be the case for everyone watching the TV. The F5000 looks just like the F5500. For a value model like this one, the look is pretty good. Samsung calls it the Slim Design. It ends up being very similar to the EH5000 from last year. Bezels surrounding the display are thin to give the TV an updated appearance. The square stand is nothing new. The profile is a bit thinner compared to the 5000 series from the previous year. Everything is a glossy black plastic. It's nice to see the low end TVs looking so good.